A 40 minute Oak Alley Plantation House tour, with hotel pick up and transportation included. 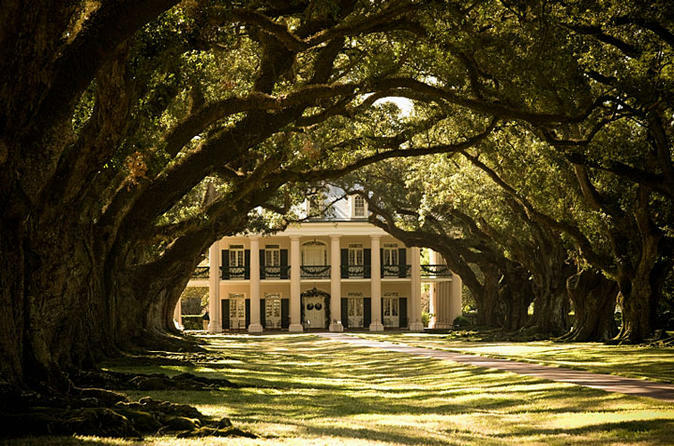 You'll be driven to the Oak Alley Plantation House, located about an hour and a half outside the city of New Orleans. This is one of the most magnificent plantation tours because of the 28, evenly spaced, huge Oak Trees that go from the river road to the Plantation House. Built in 1837 using Greek Revival architecture, and restored in 1925, this house could to be straight out of the movie “Gone with the Wind”. In addition to antique farm equipment, the twenty-five acre grounds also feature a restaurant, blacksmith shop and a souvenir shop, of which you'll enjoy some free time to peruse at your leisure. It is a comprehensive plantation experience. The tour of the Oak Alley house is conducted by guides in authentic plantation style apparel. Walking is required for this tour. The distance from the plantation house to the restaurant and souvenir shop is about 1 block. There are benches along the path, shaded by the Oaks.